Rev. Martin Luther King Jr. was a great orator is the tradition of many southern preachers and ministers. He had great use of his voice, along with poetic imagery in his speeches. This is the same delivery used in many "hell and brimstone" sermons that Southern Baptist ministers and other preachers have used. 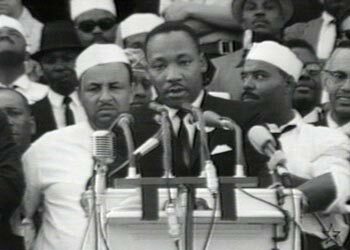 His most famous speech was I Have a Dream, given on the steps at the Lincoln Memorial in Washington D.C. on August 28, 1963. In that speech, he included three mini-speeches that he included numerous times in other speeches. They are: I've Seen the Mountain Top, I Have a Dream and Let Freedom Ring. We have included audio clips of those mini-speeches, so you can hear how he delivered the material. How can I use this material to improve my writing skills? How can I use these mini-speeches to improve my speaking skills? What is the historical significance of this material? Note the mission and goals of Rev. King in each of these mini-speeches. Do you think he was able to move people to action from these speech materials? Use this material by Rev. Martin Luther King Jr. to improve your skills in speech writing, public speaking, or history.